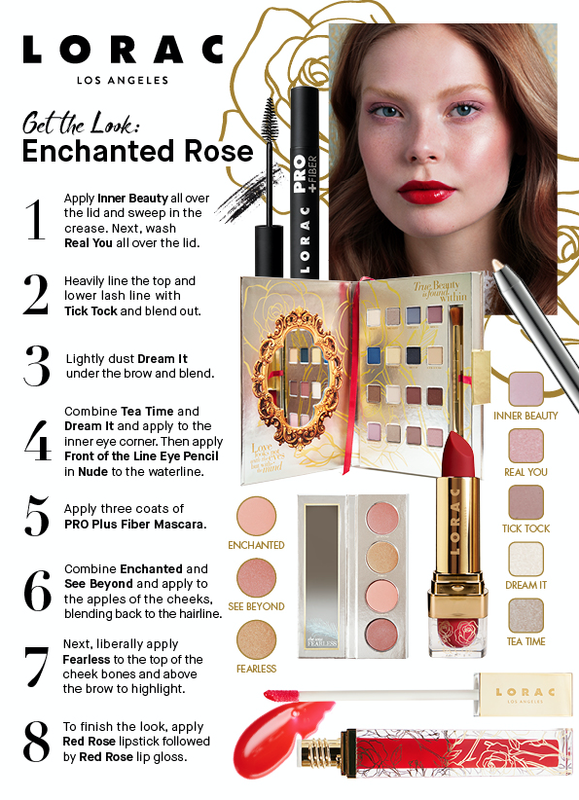 LORAC Disney Beauty And The Beast Pro Eyeshadow Palette is a limited edition palette that features 16 new and exclusive shades in a combination of matte and shimmer finishes. It comes in a rather large cardboard palette that is meant to look like a book or diary, and it is quite cute, and will definitely appeal to the collector, but I do find it a bit too large to be convenient for travel. It also includes a full-size double-sided synthetic brush for convenience. The color story is inspired by Belle's "steadfast strength and undeniable beauty"– therefore to categorize it in such terms as a "neutral palette" is to miss the point of the purpose of this collaboration, which instead, it is intent on bringing us on a "magical journey of wonder and romance." The shadows are finely milled and feel smooth in texture. I found that they deposit color evenly and glide across the skin effortlessly, but some of the matte shades are a bit more dry and stiff than the shimmer shades, but they still work beautifully. Dream It (iced gold shimmer): This is a very creamy, finely milled golden shimmer. Time Keeper (cool bronze shimmer): This is a golden brown taupe with shimmer. Our Guest (stone grey matte): This is a very muted blue grey matte. Impress (dark mahogany matte): This is a very muted plum matte with a hint of brown undertones. Beast Mode (midnight blue shimmer): This is a very dark midnight blue with a touch of teal and shimmer. Enchanting (blush gold shimmer): This is a very creamy and finely milled warm pale yellow with shimmer. It has a slight luminescent pink shift that gives this shimmer shade more dimension and interest. Swept Up (black shimmer): This shadow boasts a matte black base that is punctuated by minimal shimmer. Look Beyond (tawny matte): This camel matte shade, and it is surprisingly smooth and creamy for a matte. My Castle (spiced bronze shimmer): This is a gorgeous medium bronze shimmer with a creamy smooth texture. Chip In (rose cream matte): This is a neutral ivory matte with a slight peachy pink hue. Romance (burgundy matte): This is a warm burgundy-kissed brown matte. Spell Breaker (warm espresso shimmer): This is a deep cool-toned espresso brown with shimmer. Inner Beauty (pink peony matte): This is a light to mid-tone cool-toned matte pink. Tea Time (antiqued silver shimmer): This is a stunning light silvered taupe shimmer. Tick Tock (true mauve matte): This is a matte mauve with a slight brown undertone. Real You (fairytale pink shimmer): This is a medium cool toned pink with a shimmery finish. Ingredients (Impress, Romance, Chip In, Tick Tock, Enchanting, Look Beyond, My Castle, Time Keeper, Inner Beauty, Our Guest, Tea Time, Dream It): Mica, Talc, Boron Nitride, Silica, Dimethicone, Ethylhexy Plalmitate, Mineral Oil (Paraffinum Liquidum), Zinc Stearate, Kaolin, Glyceryl Caprylate, Cucumis Sativus (Cucumber) Fruit Extract, Carum Petroselinum (Parsley) Extract, Althaea Officinalis, Root Extract, Citrus Limon (Lemon) Peel Extract, Centaurea Cyanus Flower Extract, Calendula Officinalis Flower Extract, Lauroyl Lysine, Methicone, Water (Aqua), Proplyene Glycol, Sodium Dehydroacetate, Potassium Sorbate, May Contain: Titanium Dioxide (Ci 77891), Iron Oxides (Ci 77491, Ci 77492, Ci 77499), Ultramarines (Ci 77007), Blue 1 Lake (Ci 42090), *Carmine (Ci 75470), Manganese Violet (Ci 7774). Ingredients (Swept Up): Mica, Talc, Boron Nitride, Silica, Aluminum Calcium Sodium Silicate, Dimethicone, Ethylhexyl Palmitate, Mineral Oil (Paraffinum Liquidum), Zinc Stearate, Kaolin, Glyceral Caprylate, Cucumis Satvius (Cucumber) Fruit Extract, Carum Petroselinum (Parsley) Extract, Althaea Officinalis Root Extract, Citrus Limon (Lemon) Peel Extract, Centaurea Cyanus Flower Extract, Calendula Officinalis Flower Extract, Lauroyl Lysine, Methicone, Water (Aqua), Proplyene Glycol, Sodium Dehydroacetate, Potassium Sorbate, May Contain:Titanium Dioxide (Ci 77891), Iron Oxides (Ci 77491, Ci 77492, Ci 77499). Ingredients (Spell Breaker): Mica, Talc, Boron Nitride, Silica, Synthetic Fluorphlogopite, Zinc Stearate, Kaolin, Dimethicone, Ethylhexyl Palmitate, Mineral Oil (Paraffinum Liquidum), Glyceral Caprylate, Cucumis Satvius (Cucumber) Fruit Extract, Carum Petroselinum (Parsley) Extract, Althaea Officinalis Root Extract, Citrus Limon (Lemon) Peel Extract, Centaurea Cyanus Flower Extract, Calendula Officinalis Flower Extract, Lauroyl Lysine, Methicone, Tin Oxide, Water (Aqua), Proplyene Glycol, Sodium Dehydroacetate, Potassium Sorbate, May Contain: Titanium Dioxide (Ci 77891), Iron Oxides (Ci 77491, Ci 77492, Ci 77499), *Carmine (Ci 75470). Ingredients (Beast Mode): Mica, Talc, Alumina, Boron Nitride, Silica, Dimethicone, Ethylhexy Plalmitate, Mineral Oil (Paraffinum Liquidum), Kaolin, Glyceral Caprylate, Cucumis Sativus (Cucumber) Fruit Extract, Carum Petroselinum (Parsley) Extract, Althaea Officinalis Root Extract, Citrus Limon (Lemon) Peel Extract, Centaurea Cyanus Flower Extract, Calendula Officinalis Flower Extract, Lauroyl Lysine, Methicone, Triethoxycaprylylsilane, Zinc Stearate, Water (Aqua), Proplyene Glycol, Sodium Dehydroacetate, Potassium Sorbate, May Contain: Titanium Dioxide (Ci 77891), Ultramarines (Ci 77Oo7) Blue 1 Lake (Ci 42090), *Carmine (Ci 75470), Ferric Ammonium Ferrocyanide (Ci 75510), Ferric Ferrocyanide (Ci 75510), Black 2 (Ci 77266). Ingredients (Real You): Mica, Talc, Synthetic Fluorphlogopite, Dimethicone, Ethylhexyl Palmitate, Mineral Oil (Paraffinum Liquidum), Boron Nitride, Silica, Zinc Stearate, Kaolin, Glyceral Caprylate, Cucumis Satvius (Cucumber) Fruit Extract, Carum Petroselinum (Parsley) Extract, Althaea Officinalis Root Extract, Citrus Limon (Lemon) Peel Extract, Centaurea Cyanus Flower Extract, Calendula Officinalis Flower Extract, Lauroyl Lysine, Methicone, Water (Aqua), Proplyene Glycol, Sodium Dehydroacetate, Potassium Sorbate, May Contain: Titanium Dioxide (Ci 77891), Iron Oxides (Ci 77491, Ci 77492, Ci 77499), *Carmine (Ci 75470). *May Contain Carmine As A Color Additive. Overall Assessment: I really like this palette, and have been using Dream It, Time Keeper, Our Guest and Impress and Tea Time all of the time! If you are a Disney collector, or would wear a lot these colors, then you will probably be quite happy with this palette. If, however, you would only use a few of the shades, then you might prefer other LORAC palettes instead. $48.00 from LORAC, Ulta and Kohl's (Affiliate Links). As much as I like Lorac this just doesn't seem to be up to their typical quality. If I were still collecting cosmetics I'd want it but what I'm interested in now is their teasers for their new collections. I am quite happy with this palette, but I think that some of the mattes are a litter stiffer than their regular palettes. I haven't had a problem using any of them, and my only real complaint is that the palette itself is a bit too bulky for traveling. There are a few colors I love in this - Enchanting, My Castle and Tea Time are my kind of colors. Lately though I'm wearing more purples too. Maybe I need to go see this in person! I agree, and I would add Time Keeper to your list! It is definitely worth checking out this palette. The only real problem is the bulkiness of the palette itself– which really isn't convenient for traveling. I'm not a Disney-phile so it doesn't appeal to me on that note (though I love Cocteau's La Belle et La Bete), but the shades in this coolish-toned palette are very attractive to me. If I still hadn't even opened the Lorac palette I bought a year ago, I'd consider it! Nor am I, and I don't collect theme based products for their packaging (at all). Cocteau's La Belle et La Bete is definitely one of my favorites off all time– such a magical movie! If you still haven't opened your LORAC palette from last year– then I would say this is probably a pass– unless there are colors in this palette that you would really love to wear (assuming you don't have dupes). This collection is adorable! Beauty and the Beast was my favorite movie during my childhood! It is, and if that is your favorite childhood movie you might not want to miss out on this palette!